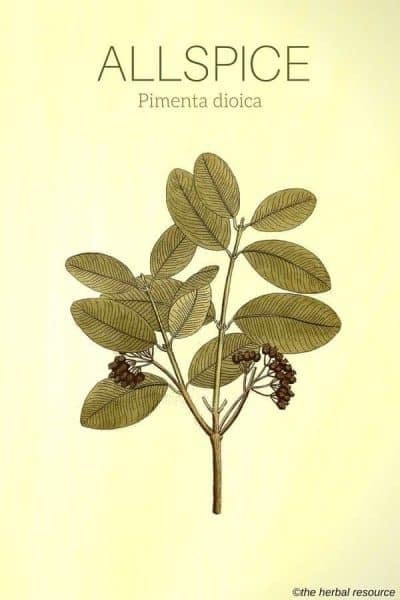 Botanical Name of Allspice: Pimenta dioica. The name “allspice” is due to the unique scent of its leaves and berries, a blend of the aromas of cloves, black pepper, cinnamon, and nutmeg. The name of the spice has caused some confusion leading many to believe it is a mixture of spices. The 15th-century Spanish explorers who were intent on finding a New World source of black pepper confused Pimenta dioica with the expensive East Indian spice (Piper nigrum). The Spanish explorer named the plant “Pimienta de Jamaica” (pepper from Jamaica), but when it turned out that it was not real pepper, the interest in the spice diminished. Nearly 100 years later, the spice regained some interest, and the tree and seeds were imported to Spain. What is Allspice Used for? 1 What is Allspice Used for? Allspice is mostly used as a spice, but it does have a history of traditional and folk medicinal uses. Some uses of the herb as herbal medicine have, to a certain degree, been substantiated by scientific methods but more and thorough studies are needed to rate the herb’s effectiveness fully. The herb is regarded to have carminative, digestive stimulant, and aromatic qualities. Its active constituents are anti-inflammatory, rubefacient (warming and soothing) and anti-flatulent. 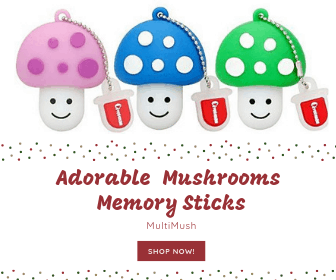 It is used traditionally as a natural remedy for stomach-ache, vomiting, diarrhea, fever, flu, colds, fatigue, diabetes, menstrual cramps, heavy menstrual bleeding and hysterical paroxysms. Crushed allspice berries are used as a topical application to treat bruises and to soothe sore joints and muscles. They contain tannins that have a mild anesthetic action. Because of this warming effect, the berries are used as an herbal remedy for arthritis and sore muscles, either as a poultice or in hot baths. The dried berries are used far more as a spice than herbal medicine. Allspice has a rich, pleasant and warm aroma, and as a spice, it is used in many kinds of ketchup, pickles, desserts, sauces, and soups, often as a less expensive substitute for cloves. Also, it is used in marination of herrings, in sausage making and baking. Allspice enhances the flavor of pineapples, plums, black currants, and apples and fits well together with chili, cloves, coriander, garlic, ginger, nutmeg, mustard, pepper, rosemary, and thyme. Its active components include caryophyllene and methyl eugenol, glycosides, gum, minerals, quercetin, resin, sesquiterpenes, sugar, tannin. Eugenol is a phenylpropanoid that gives allspice its characteristic pleasant, sweet aroma. Allspice is rich in vitamins A, C, niacin, riboflavin, and thiamine, the minerals potassium, manganese, iron, selenium and magnesium, and contains the metabolites homo-mandelic acid and homovanillic acid. It is primarily the immature fruit (berries) that is used as a spice and herbal medicine. The berries have two kernels and are handpicked when fully developed, but still green, as the content of essential oil decreases during maturation. The ripe or freshly picked berries have almost no taste, it appears during the drying process. The immature fruits are dried in the sun or by artificial heat and sorted later by size. Allspice berries can be bought as whole or as ground spices. The whole berries have a long shelf life and can be stored for years in a dry, dark place. When the berries are ground, the spice will gradually lose its aroma, so it is best not to store more than a few months of supplies. The easiest way when it comes to using allspice is to use it as a spice, but it can also be used in powder form to make a tea. How to make allspice tea: Add one teaspoon of powder in an of boiling water. Steep for 10 minutes. Allspice is sold as dried raw fruits, which be found in the spice section of a grocery store. It is also available as an oil or other commercial preparations. The usual dosage of allspice as a commercial supplement is one or two capsules, taken twice daily with water before eating. Always read the label for ingredients and follow instructions and warnings. Carefully research the medicinal herb intended for use. Most importantly select only reputable sources when buying herbs. When using medicinal herbs for any health purposes, please consult a health practitioner. Allspice may cause allergic reactions in hypersensitive individuals. It should be avoided during pregnancy and while breastfeeding. When using the herb topically, watch for hypersensitive reactions. It is contraindicated for those with chronic gastrointestinal conditions such as duodenal ulcers, reflux disease, spastic colitis, diverticulitis, disarticulates and ulcerative colitis. Some research data suggest that eugenol may pose an undetermined risk for promoting cancer growth so people with cancer or who are at high risk for cancer should not use this herb. It is essential to consult a healthcare professional when using herbal medications to treat illness because some herbs will interact with other drugs or interfere with their effect. It is important to remember that medicinal herbs may produce side effects or may carry some element of risk (although side-effects and risks are generally less severe and frequent than in synthetic drugs). Any appropriate precautions and contraindications should be clearly understood. The plant is native to southern Mexico, Central America, and the West Indies. Today, allspice is grown commercially in Mexico, Honduras, Trinidad, Cuba, and Jamaica. It is the only spice that’s unique to the New World. 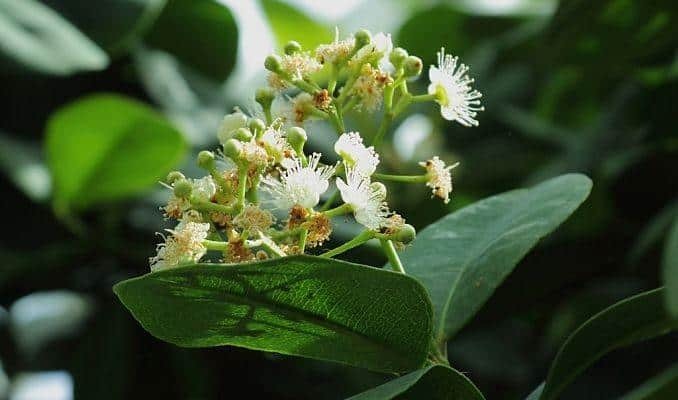 Pimenta dioica is a tropical evergreen tree that grows to a height of 22 to 43 feet (7 to 13m). The allspice tree has grayish-white bark that peels in thin sheets. It is a slow-growing, shrubby tropical tree with large, glossy leaves that are elliptical. The leaves are opposite and elliptical, about 8 inches long and 2 inches wide. Its leathery leaves are an attractive glossy green and pleasantly aromatic. At the leaf axils, pyramidal cymes of small white flowers develop. The flowers are male and female; the female flowers are fruiting and develop into clusters of pea-sized, brownish green, spicy berries with one or two seeds. Hylton, William H.: The Rodale Herb Book. Emmhaus, Pennsylvania, Rodale Press 1974. Lust, John: The Herb Book. New York. Bantam Books 1974. Meyer, Clarence: The Herbalist Almanac. Glenwood, Illinois. Meyerbooks 1994. Meyer, Clarence: Old Ways Rediscovered. Glenwood, Illinois. Meyerbooks 1988. Tierra, Michael: Planetary Herbology. PO Box 325, Twin Lakes. Lotus Press 1992. Foster, Steven & James A. Duke: Peterson Field Guide Eastern Central Medicinal Plants and Herbs. New York. Houghton Mifflin Harcourt 1999.